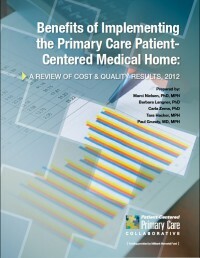 The Patient Centered Primary Care Collaborative has just released a report on the ‘Benefits of Implementing the Patient Centred Medical Home‘. This report documents the outcomes of a number of projects based around the medical home model of care. There are three broad conclusions. As medical home implementation increases, better health, better care and lower costs are being achieved. Momentum for the medical home model in the US is rapidly increasing with public and private sector investment. The concept of the PCMH is evolving to include the medical neighborhood. A mounting body of data demonstrates that the PCMH is an effective means of delivering primary care to achieve the triple aim outcomes of better health, better care, and lower costs. There is far-reaching interest from insurers and government in the medical home delivery model as a means to control costs, improve patient satisfaction and make people healthier. Numerous communities across the US have embraced this model of care at the local level. In the current economic environment, controlling the rising cost of health care is paramount. Although implementing the many features of a PCMH takes time, the long-term cost savings of the PCMH are impressive, as demonstrated by mature PCMH initiatives. By providing better care coordination that results in fewer unnecessary emergency room visits and inpatient hospital admissions, this report also demonstrates that PCMHs can achieve cost-savings in the short-term. Continued focus on care delivery reform and integration, health information technology diffusion, payment reform and value based purchase of insurance, as well as education and training for a robust primary care workforce are all critical to the PCMH’s long-term success. In addition, effective collaboration with patients and families in all aspects of primary care redesign and evaluation will be essential. Benefits of Implementing the PCMH: Report | The Patient Centered Medical Home (PCMH) Will Restructure Healthcare Around the Patient.